People may search for a long time, but they know it when they see it—the right job in the right town, or the right house in the right neighborhood. Then they settle down, set up shop, and put down roots. At the bottom of the ocean, tiny larvae of deep-sea animals, floating through the black depths, make a similar quest. The offspring of tubeworms, giant clams, and other organisms that form thriving communities of life around seafloor hydrothermal vents must find the right conditions for them to settle down, live, grow, and reproduce. How they do that has remained a mystery. In the 28 years since tubeworms and other organisms were discovered living in volcanic areas along mid-ocean ridges, scientists have been puzzling over how they survive there. 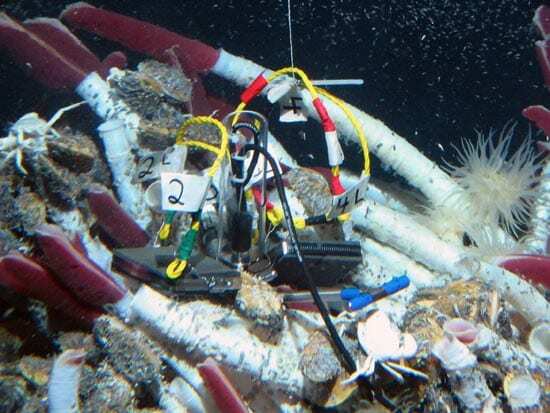 Woods Hole Oceanographic Institution biologist Tim Shank calls the vent sites “Earth’s largest chemosynthetic community,” where inhabitants live without sunlight and instead convert chemicals from vent fluids into energy and nutrient sources. Understanding the factors that determine why larvae settle is a key first step to understanding the bigger picture of how seafloor life has developed across the wide expanse of the ocean throughout time. In a similar way, scientists have studied how and why human populations developed and moved out of Africa, crossed the Bering Strait into the New World, or later journeyed across oceans via ships during the colonial era. Over the short term, social scientists also seek to understand the factors that cause demographic shifts—from urban to suburban communities, for example, or from the U.S. East Coast to the Southwest. Equivalent population movements occur on the seafloor, and they all begin with organisms finding places to accommodate their basic needs. For larvae of hydrothermal vent organisms, those factors include basalt (volcanic seafloor rock) on which to settle, and the right acidity and temperature of seawater. To begin learning exactly why larvae prefer one swath of seafloor to another, Shank and fellow WHOI biologists Stefan Sievert and Stace Beaulieu teamed up last year using a grant from the WHOI Deep Ocean Exploration Institute. They began in February 2004 by deploying small basalt panels as an experiment at a hydrothermal vent site called Tica Vent on the East Pacific Rise. This mountainous undersea area is located about 3,700 kilometers (2,000 nautical miles) west of Central America. 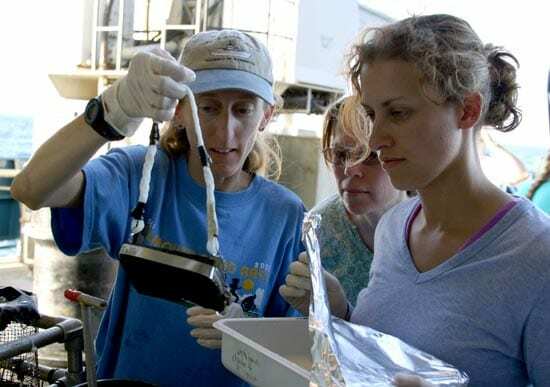 During three cruises in 2004 to the East Pacific Rise, the science team began a series of studies that was repeated this spring at the Galápagos Rift, located off the Galápagos Islands near the equator, to see how microbes and larvae settle over time. Traveling to Tica Vent on the research vessel Atlantis, the biologists worked at a lush and thriving community of giant tubeworms and mussels. Using the submersible Alvin, they placed 17 pre-cut, 4-inch squares of rock basalt previously collected from the site. The squares acted as seafloor petri dishes, growing microbes and providing a settlement surface for larvae in their natural surroundings. “Microbes might coat the surface of the basalt and serve to indicate to the larvae that a particular spot is good for settling,” said Beaulieu. She suspects they may act as a conditioner for larval settlement, in the same way that a paint primer brushed on walls allows subsequent paint layers to adhere better. 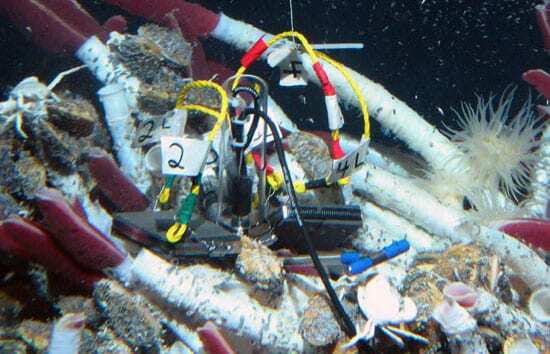 Nearby sensors monitored the temperature and chemistry of the vent fluid, including acidity and hydrogen sulfide levels, for a clearer picture of how the vents influence the larvae’s settlement. The scientists returned to collect and replace the squares over the following four, nine, and 13 days, as well as on later expeditions after two and nine months. This allowed time for the microbes and larvae to settle over different time spans. “To the naked eye, the squares recovered after four, nine, and 13 days looked relatively bare,” said Beaulieu. To peer closer, she headed to the ship’s lab to use a special microscope to photograph where larvae settled on the squares. The lab’s temperature was set at 2°C (35°F) to prevent seafloor microbes and the larvae that settled and metamorphosized—known to scientists as “recruits”—from rapidly decomposing, and thus fouling the research. That’s why Beaulieu packed winter clothes for the trip to the equatorial Pacific.Using forceps, Beaulieu plucked out tiny recruits, one by one, and placed them in tubes. 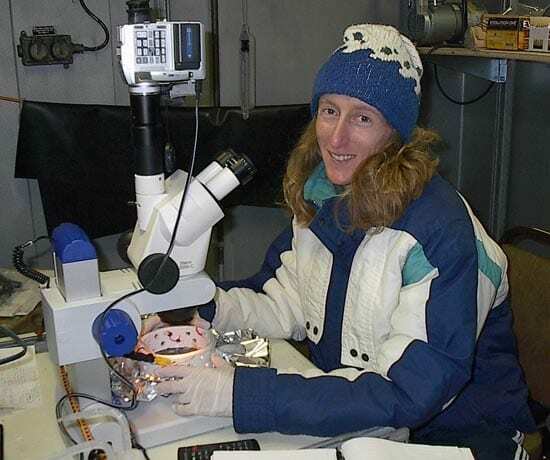 “For up to nine hours after Alvin returned from the dive, we labored at the scope,” she noted. “While many scientists and crew were deep asleep, we were sequestered in the bio lab’s walk-in freezer, forceps at hand. “It can be difficult to take photos through a microscope on a rocking ship,” she added. Unlike the recruits, microbes are too small to pluck off. So after Beaulieu was finished, the squares were frozen for subseqent studies to identify organisms by their DNA. To do that, the scientists first needed to extract DNA from the samples. “This is especially exciting because it’s the first time it has been done,” she said. Back at WHOI in February 2005, Beaulieu developed a technique using a jewelry- and tool-cleaning machine. It sends ultrasonic waves to the surface of the squares, which break up cells that may have accumulated there. DNA is then extracted into a liquid solution that is purified to remove other organic compounds, such as proteins. With relatively pure DNA in hand, Sievert has begun analyses to identify microbes that may have colonized the larval panels, while Beaulieu and Shank search for DNA to identify larval recruits plucked from the basalt surfaces.